Fruit juices make the best of mocktails… plus they’re healthier! Well, that’s just an excuse to have a glass of this chilled drink straight from heaven. 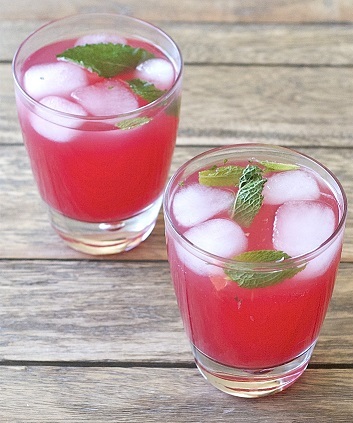 Cranberry juice, orange juice, lime juice, sugar and mint, this mocktail has it all. I promise, each sip is going to be a burst of flavors in your mouth. Blend it up and serve it to guests at a party. They’ll love it as much as you! Add sugar to the boiling water and stir constantly until the sugar is completely dissolved. Don’t boil the mixture too long otherwise it will get too thick. Once the sugar is dissolved, remove the saucepan from the heat and let the mixture cool. It will thicken a bit when cooled. This will yield a quantity of syrup more than that required for this recipe. Store the remaining syrup in a bottle and keep it in the refrigerator. This syrup can be used for up to 6 months. Add the orange juice, lime juice, cranberry juice, 1 tablespoon sugar syrup (prepared above), mint leaves and ice to a blender. Blend the mixture vigorously for about 8 – 10 seconds. Divide the mixture evenly into two glasses. Add about 3/4 cups club soda to each glass. Add additional ice and garnish with mint leaves or orange slices if desired. Serve!